At the Oral History Association conference in Minneapolis last week, I was lucky to hear Staughton and Alice Lynd talk about their long career as social justice advocates and oral historians. One thing particularly struck me: they said that they always listened not just for people’s experience, but for their analysis of that experience. And that analytical perspective (or a range of them) is one thing I like about this particular Stories of the Swamp Ward episode. Ken Matthews talks about how “when you have a depression you pretty much know a war’s coming”; Kevin Blaney remembers that the “winos” down by the waterfront were veterans, and seems to have surmised even as a child that they drank to forget; Garth Amey observes the distance between his father’s war experience and what he said about it. Although this community was far away from the battlefields, and thus far from the war’s most extreme effects on civilians, there was quite a lot of complexity and intensity in the way people experienced and characterized the home front experience. Three themes in particular seem to emerge. One is the proximity of World War I and World War II. Of course that’s not a surprise: we can all do the math between 1918 and 1939. But people’s insistence on their elders’ sense of the immediacy of the previous war made me think about what that timing meant in a family. It meant that a man who survived service in the first war could see his son go off to the second. Or that the mother of a veteran or a soldier who died might be worrying about her grandson on the front. I hadn’t really registered this before. The feeling of trepidation is vividly captured in Charley Forte’s mother’s remark that the “blood red” sky as her son Jimmy left Kingston for the front “was just like” it was when Kingston men left for the first war. That’s a pretty foreboding association. Another thing that came out in our interviews is the way that the war incorporated immigrants in the “Canadian” fold — at least for a time. Before the war, “Canadian” seemed to mean what Mike Tureski calls “British English.” But the Swamp Ward was home to people of many backgrounds including Irish, French-Canadians, Ukrainians, Slovaks, Jews, and so on. Many of these people signed up for the army, served, and sometimes died. Children of all backgrounds were recruited to collect milkweed fluff and to sing The Maple Leaf Forever. Tureski remembers his family’s house on James Street as a marshalling ground for Ukrainian friends and relatives from across Canada, on their way overseas. (For a short oral history from a Ukrainian-Canadian veteran from Saskatoon, see here.) On VE Day, Mr. Drinka converted his dump truck into a float and Ukrainians in costume danced upon it all the way down Princess Street. And yet, after the war, mistrust of Eastern Europeans returned very quickly. Mary (Yankovic) Crawford remembers that a nun teaching at her high school south of Princess Street told the class that they shouldn’t associate with her because she was a Communist. This was based on nothing but the news. Finally — as you will no doubt notice — the gendered differences in war experience were revealed dramatically in our interviews. You hear about Bill Hackett’s mother, who “was never the same” after her eldest disappeared over Berlin. You hear about Garth Amey’s mother who, at 17 and a new bride, spent four years setting up house in Kingston and waiting for her husband to return — which he did, suffering from PTSD. Marc Shaw’s mother was never allowed to talk about her father who had been killed in service, and she told Marc that she remembered the moment she realized she did not even remember what her father looked like. With that in mind, I present a photo of her parents here, an image she apparently was not shown and could not conjure, but that her son has preserved. In stark contrast to all this grief, we also interviewed two women who were unmarried teenagers during the war. 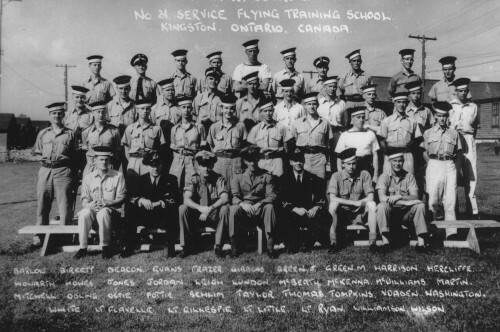 You’ll remember that when I asked the first, Lorraine Good, what she remembered, she said, with a twinkle in her eye, “the dances.” And when I asked the second, she said, not missing a beat, “the boys.” Poor Kingston men: while they were overseas, a flood of pilots-in-training from across the Commonwealth arrived in Kingston! In the podcast you hear Isobel Gordon talking about “keeping open house” on Patrick Street for handsome pilots and musicians. She had four sisters. Two of them married pilots from New Zealand and moved to the other side of the world. Their mother was so distraught that after the war her brother (George Bennett) paid for a third sister, Helen, to fly to New Zealand to visit. 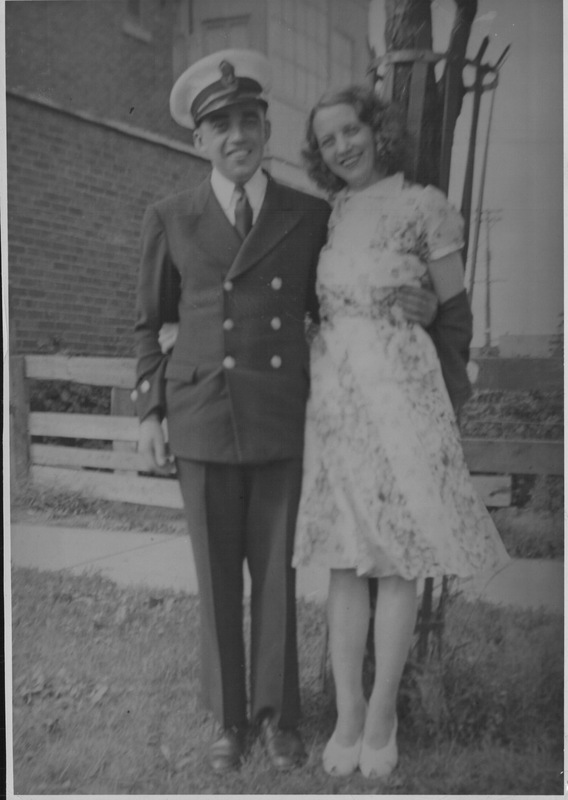 At a stop in Hawaii on the way, Helen gave her address to a man who promised to send her photos of their day in Pearl Harbour — and though she did come home to her mother in the short run, she married this fellow and also moved to New Zealand! So, those are a few comments and additions to our material on the war as it looked from the Swamp Ward. If you have memories yourself, don’t hesitate to get in touch with us.